These are exciting days for pro football fans here around Atlanta. Everyone is pulling for the Falcons in the Super Bowl! They’re making up cheers and dances. Heck, there are probably a few die-hard fans who are already setting up their tailgate spots. And who can blame them? The last time the Falcons went to the Super Bowl was in 1999. That’s a long time to wait, y’all. Did you know that the Falcons training facility is in Flowery Branch, Georgia? Yep, just about 5 miles down the road from us. Whenever we see some outrageously expensive luxury sports car flying down the interstate in that direction, we always say, “must be one of the Falcons.” It’s also funny to run into one of them in the local Subway. Let me tell you something – those fellows can eat! We’ll definitely be pulling for the Falcons in the Super Bowl. And, in my opinion, football game watching calls for some serious snacks. 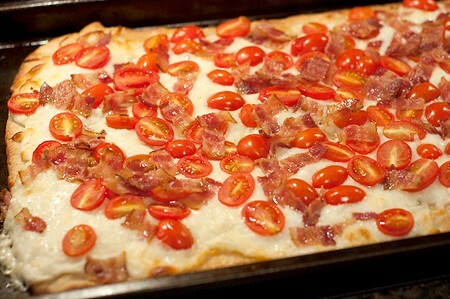 Like this BLT Pizza for instance. This is one tasty, quick, and easy pizza, too. I admit I took several shortcuts with this recipe, but hey – you need to hurry and get that pizza in the hands of your football fans. Right? To make your pizza prep simple, try using one of these refrigerated Pillsbury® Thin Pizza Crusts. They’re right there in the dairy case at your grocery store. Unroll the crust into a baking sheet and pop it into a 400 degree preheated oven. Let it cook for about 5 minutes, take it out and slather on some purchased (yes, purchased!) Alfredo sauce. I got a version with roasted garlic and Parmesan. It’s yummy. Top the Alfredo sauce with lots of mozzarella and halved grape tomatoes. Next, dice up 10 or 12 strips of packaged, fully cooked (yes, another shortcut!) bacon and scatter that on as well. Pop the pan back in the oven and cook for another 10 to 12 minutes or until the crust is browned, the cheese is bubbly, the bacon is crispy, and the tomatoes are a little slumped and roasted. Remove the pizza from the oven and top with a sprinkling of arugula. Y’all. I have to tell you. This is truly one of the tastiest pizzas ever. BeeBop absolutely loved it. Make one for your football-watching folks. They’re gonna love it, too. Promise. 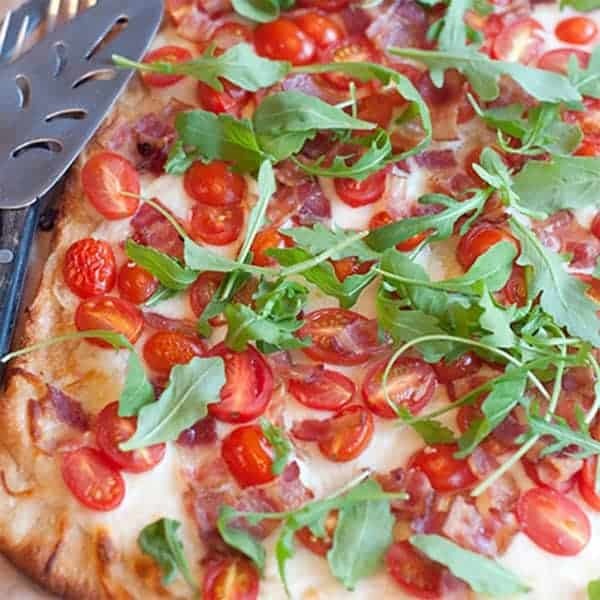 A thin, crisp pizza crust topped with garlicky Alfredo sauce, mozzarella, grape tomatoes, bacon, and arugula. 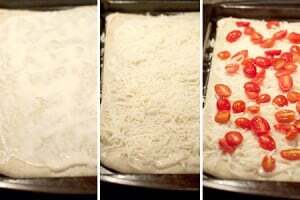 Unroll the pizza crust and place it in on a baking pan. Bake for 5 minutes and remove from oven. 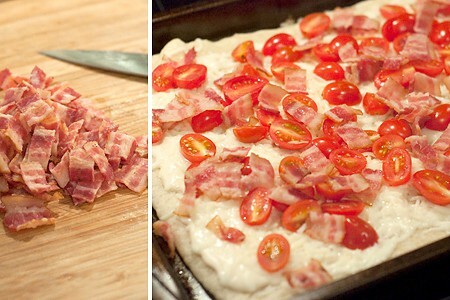 Top with Alfredo sauce, cheese, grape tomatoes, and bacon. Return to oven and bake for 10-12 minutes or until the crust is golden brown and the cheese is bubbly. Yum this looks amazing! Fun recipe and nice pics. Thanks, Jessica. It’s a little different and so good. I’m craving it again, too! It’s so good. I LOVE this! Such gorgeous photos too. I mean I really love it. You are the best cook ever Miss Lana! Caught you in my feed again & that sure looks delicious Lana!! Of course, down here in Saints territory, Atlanta is not a favorite team, BUT I did tell my husband that he was required to at least root for a Southern team in this case, regardless! :) With Mardi Gras in full swing & the Super Bowl in New Orleans, things are sure hopping down here on the Mississippi Gulf Coast right now!! It has been a long time for the Falcons since they got this close to the Super Bowl. We’re all pulling for them! Wow! This looks delicious. Stunning photography! I will be making this at home very soon. Thanks, Emma. Hope you enjoy the pizza! I would eat this for breakfast. Really. Absolutely! I do it all the time. Love, love, love the intro shot. Oh…pesto on this would be really wonderful! Thanks for the idea, Kay. I was pleased with that photo, myself. Every once in a while I get one right. BLT + Pizza? Yeah…I’m in. sorry to report, but this recipe was NOT very good. I’m sorry to hear that you didn’t like it. It’s a real favorite of ours. Mmmm that bacon is looking real good. Thin crust sounds great! Do you have a prepackaged Alfredo sauce you recommend? Hi Marcia – for this recipe I like the Prego Roasted Garlic with Parmesan.